The Alaska Range is a relatively narrow, 650-km-long (400 mi) mountain range in the southcentral region of the U.S. state of Alaska, from Lake Clark at its southwest end  to the White River in Canada's Yukon Territory in the southeast. The highest mountain in North America, Denali, is in the Alaska Range. It is part of the American Cordillera. The range is part of the Pacific Ring of Fire, and the Denali Fault that runs along the southern edge of the range is responsible for a number of earthquakes. Mount Spurr is a stratovolcano located in the northeastern end of the Aleutian Volcanic Arc of Alaska, USA which has two vents, the summit and nearby Crater Peak. Parts of the range are protected within Wrangell-St. Elias National Park and Preserve, Denali National Park and Preserve, and Lake Clark National Park and Preserve. The George Parks Highway from Anchorage to Fairbanks, the Richardson Highway from Valdez to Fairbanks, and the Tok Cut-Off from Gulkana Junction to Tok, Alaska pass through low parts of the range. The Alaska Pipeline parallels the Richardson Highway. The name "Alaskan Range" appears to have been first applied to these mountains in 1869 by naturalist W. H. Dall. The name eventually became "Alaska Range" through local use. In 1849 Constantin Grewingk applied the name "Tschigmit" to this mountain range. A map made by the General Land Office in 1869 calls the southwestern part of the Alaska Range the "Chigmit Mountains" and the northeastern part the "Beaver Mountains". 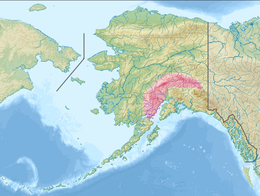 However the Chigmit Mountains are now considered part of the Aleutian Range. ^ a b Sources differ as to the exact delineation of the Alaska Range. The Board on Geographic Names entry is inconsistent; part of it designates Iliamna Lake as the southwestern end, and part of the entry has the range ending at the Telaquana and Neacola Rivers. Other sources identify Lake Clark, in between those two, as the endpoint. This also means that the status of the Neacola Mountains is unclear: it is usually identified as the northernmost subrange of the Aleutian Range, but it could also be considered the southernmost part of the Alaska Range. ^ Name history from the Board on Geographic Names entry for the Alaska Range. ^ Cross Country Magazine, Vol 171. Pages 52-52. 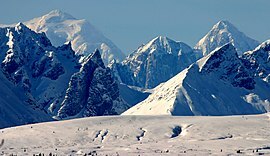 Red Bull Media House Films "Under the Midnight Sun"
Wikimedia Commons has media related to Alaska Range.